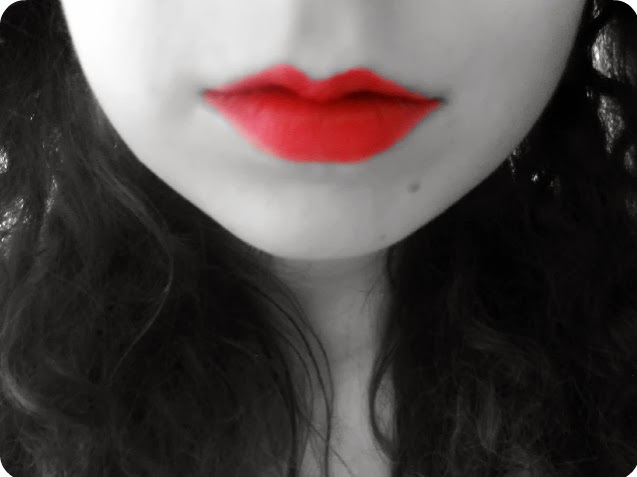 Hey guys, today I wanted to do a lipstick review of the MAC lipstick Russian Red. I don’t have that many MAC lipsticks even though they are really good quality, I think I only have three. One of my first posts on this blog was a review of the MAC lipstick Shy Girl and I still love it as much today as I did back then. There is no question that MAC do really great quality products but the main reason why a lot of people ( beauty bloggers/gurus aside) don’t buy that many MAC products is because of how expensive they are. I don’t even need to think or look anything thing up to tell you that MAC lipsticks are €18 here where I live. I know this without any hesitation because I love MAC lipsticks a lot, they are probably my favourite brand of lipstick, but only rarely allow myself to spend so much on them because if I were to buy a MAC lipstick every week I would be beyond broke by now. MAC lipsticks are great to buy yourself as a treat, to maybe reward yourself for doing however much study, for getting a great result in a exam, or for successfully getting that job you wanted. So, in case any of you were instantly thinking that there is no way that you could buy a MAC lipstick because of how expensive they are, you can easily save it up over a month or two, €1 at a time. Okay, sorry for that, now onto the Russian Red review. MAC’s Russian Red lipstick is best known as the must have red lipstick for everyone. It is supposed to suit everyone well and unlike other red lipsticks which can make your teeth appear more yellow, Russian Red has a blue tint undertone which makes sure that this isn’t a problem. Russian Red has a Matte finish which is one of my favourite MAC finishes along with Cremesheen. The finish is basically matte, obviously, with no sheen or glossy appearance. The great thing about this is that you can have the best of both worlds; if you want to leave it matte you can, or if you prefer a glossy finish you can put some clear lip gloss over it. The color is a beautiful deep red and is really pigmented, so you don’ have to worry about it not transferring well to your lips. I also doesn’t dry out your lips or make them appear to be more dry than they actually are like other lipsticks can. 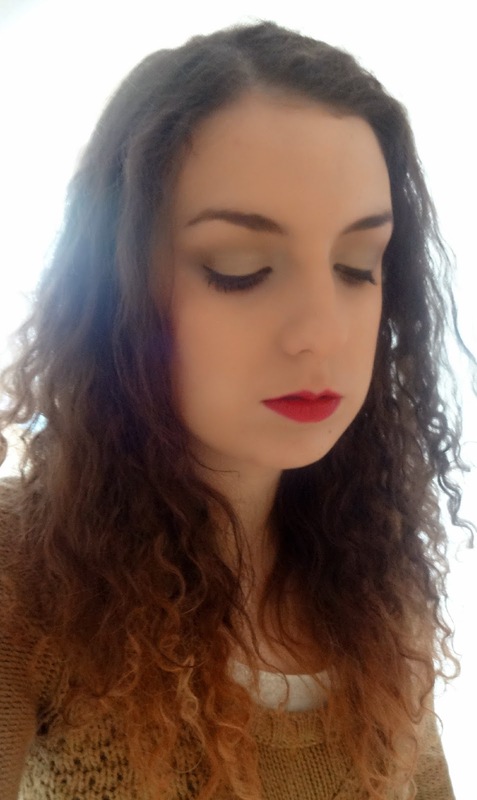 I find that the Russian Red lipstick, like other MAC lipsticks, lasts for a really long time, especially if you put lip liner underneath it, which you usually need to do to get the perfect red lip anyway. I usually just line around my lips first with a cheap Essence lip liner in red blush which is less than €1.50 (there really isn’t any need to buy an expensive liner considering how much the lipstick costs, and I don’t think there is ever that much difference in lip liner quality anyway), once around my lips are lined I then usually fill in the lips with the liner so that the lipstick has a base to stick to and will then last longer than it would have on it’s own. Overall, I really like this lipstick, not only for the great quality that most MAC lipsticks have but I also really love the colour and the finish. Me wearing Russian Red lipstick in my golden Christmas makeup look. I hope you liked this post. If you did, please give it a +1 on Google plus or like it on Bloglovin so I know to do more reviews like this in the future. If you are interested in getting this product, you can buy it at any Mac counter or click here to buy it online. If there is anything else you would like me to review, leave a comment down below telling me what. Previous Post MoYou Nails: The Simple Way to do Nail Art? Next Post Hurricane in Ireland?